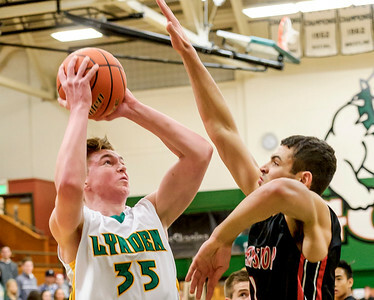 Lynden defeats Archbishop Murphy 64 to 45. Archbishop Murphy's Jaylon Carter (12) covers Lynden's Sterling Somers (13) as he attempts a basket during the second quarter in the 2A District Boys Tournament on Saturday evening Feb. 20, 2016, at Mount Vernon High School in Mount Vernon, Wash. Somers scored 18 points to help Lynden defeat Archbishop Murphy 64 to 45. 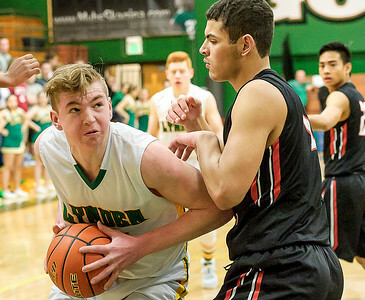 Lynden's Davis Bode (35) attempts to maneuver around Archbishop Murphy's Abraham Lucas 91) during the first quarter in the 2A District Boys Tournament on Saturday evening Feb. 20, 2016, at Mount Vernon High School in Mount Vernon, Wash. 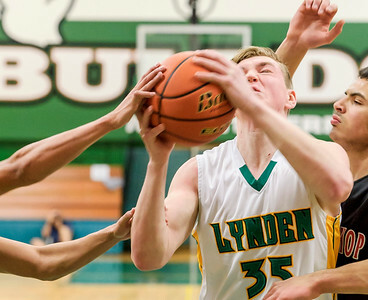 Bode scored a total of 6 points to help Lynden in their 64 to 45 win. 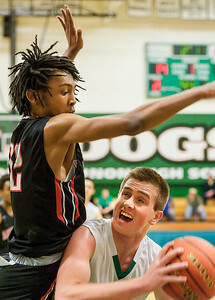 Lynden's Sterling Somers (13), right, scores against Archbishop Murphy's Jaylon Carter (12) during the second quarter in the 2A District 1 Boys Tournament on Saturday evening Feb. 20, 2016, at Mount Vernon High School in Mount Vernon, Wash. Somers scored 18 points to help Lynden defeat Archbishop Murphy 64 to 45. 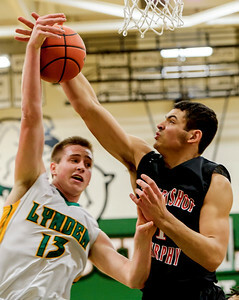 Lynden's Sterling Somers (13) attempts to shoot against Archbishop Murphy's Abraham Lucas during the second quarter in the 2A District Boys Tournament on Saturday evening Feb. 20, 2016, at Mount Vernon High School in Mount Vernon, Wash. Somers scored 18 points to help Lynden defeat Archbishop Murphy 64 to 45. 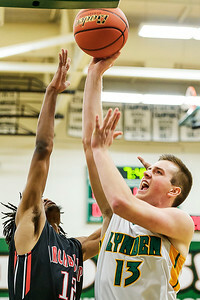 Lynden's Davis Bode (35) shoots over Archbishop Murphy's Abraham Lucas (1) during the first quarter in the 2A District Boys Tournament on Saturday evening Feb. 20, 2016, at Mount Vernon High School in Mount Vernon, Wash. 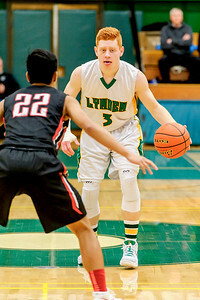 Bode was fouled on the play making the extra points for a total of 6 to help Lynden defeat Archbishop Murphy 64 to 45. 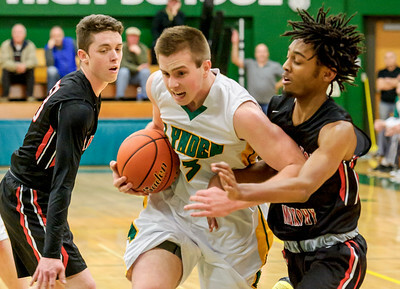 Lynden's Davis Bode (35) fights for possession against Archbishop Murphy during the second quarter in the 2A District 1 Boys Tournament on Saturday evening Feb. 20, 2016, at Mount Vernon High School in Mount Vernon, Wash. 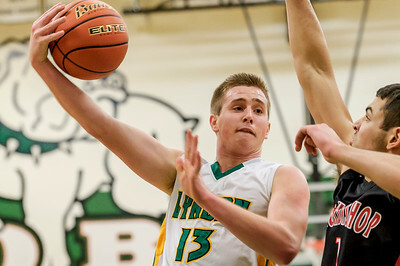 Bode scored 6 points to help Lynden defeat Archbishop Murphy 64 to 45. 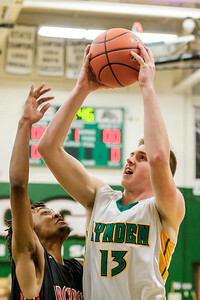 Lynden Lions conduct pregame practice prior to their match against Archbishop Murphy in the 2A District Boys Tournament on Saturday evening Feb. 20, 2016, at Mount Vernon High School in Mount Vernon, Wash. Lynden defeated Archbishop Murphy 64 to 45. 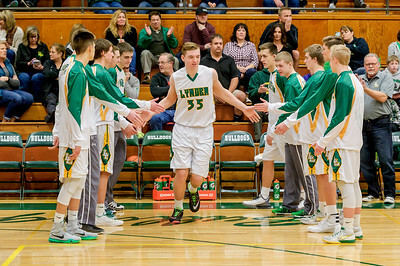 Lynden's Davis Bode (35) is introduced prior to their game against Archbishop Murphy in the 2A District Boys Tournament on Saturday evening Feb. 20, 2016, at Mount Vernon High School in Mount Vernon, Wash. 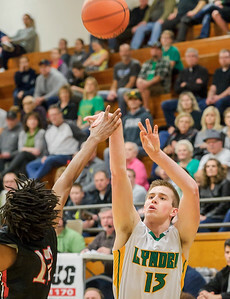 Bode scored 6 point as Lynden defeated Archbishop Murphy 64 to 45. Lynden's Noah King (3) pauses as he moves the ball againt Archbishop Murphy's Josh Parafina (22) during the second quarter in the 2A District Boys Tournament on Saturday evening Feb. 20, 2016, at Mount Vernon High School in Mount Vernon, Wash. King scored 7 points to help Lynden defeat Archbishop Murphy 64 to 45. Archbishop Murphy's Jaylon Carter (12), right, shoots over Lynden's Carson Bode (35) during the first quarter in the 2A District Boys Tournament on Saturday evening Feb. 20, 2016, at Mount Vernon High School in Mount Vernon, Wash. Lynden defeated Archbishop Murphy 64 to 45. Lynden's Sterling Somers (13) squeezes between Archbishop Murphy's Housten Schmutz (13), left, and Jaylon Carter (12) during the second quarter in the 2A District 1 Boys Tournament on Saturday evening Feb. 20, 2016, at Mount Vernon High School in Mount Vernon, Wash. Somers scored 18 points to help Lynden defeat Archbishop Murphy 64 to 45. 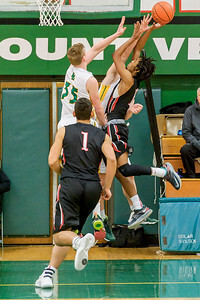 Lynden's Sterling Somers (13), left, is blocked by Archbishop Murphy's Abraham Lucas (1) during the second quarter in the 2A District 1 Boys Tournament on Saturday evening Feb. 20, 2016, at Mount Vernon High School in Mount Vernon, Wash. Somers scored 18 points to help Lynden defeat Archbishop Murphy 64 to 45. 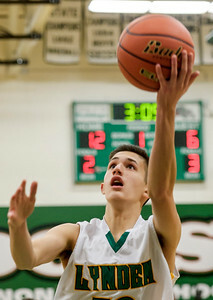 Lynden's Christian Zamora (32) works an easy layup against Archbishop Murphy during the second quarter of the 2A District Boys Tournament on Saturday evening Feb. 20, 2016, at Mount Vernon High School in Mount Vernon, Wash. Zamora scored 8 points to help Lynden defeat Archbishop Murphy 64 to 45. 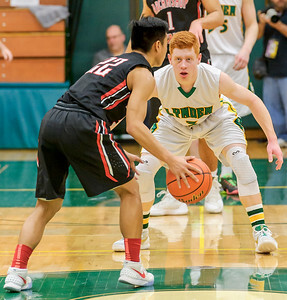 Lynden's Noah King (3) looks to steal from Archbishop Murphy's Josh Parafina (22) during the second quarter in the 2A District Boys Tournament on Saturday evening Feb. 20, 2016, at Mount Vernon High School in Mount Vernon, Wash. King scored 7 points to help Lynden defeat Archbishop Murphy 64 to 45. 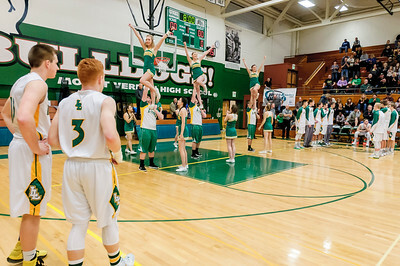 Lynden Lions cheer squad during player introductions prior to their game against Archbishop Murphy in the 2A District Boys Tournament on Saturday evening Feb. 20, 2016, at Mount Vernon High School in Mount Vernon, Wash. Lynden defeated Archbishop Murphy 64 to 45. 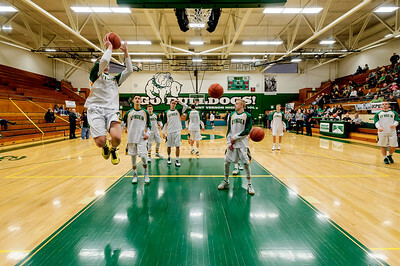 Lynden's Sterling Somers (13), left, and Noah King (3) watch as their team is introduced to the fans prior to their game against Archbishop Murphy in the 2A District Boys Tournament on Saturday evening Feb. 20, 2016, at Mount Vernon High School in Mount Vernon, Wash. Somers score 18 and King scored 8 points to help Lynden defeat Archbishop Murphy 64 to 45.